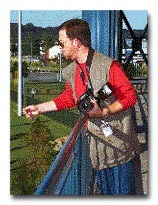 Herb Cawthorne, Certified Professional Photographer, specializes in wildlife and aerial photography and digital imaging. His interest in photography began as a teenager photographing the wildlife near his home in Appomattox, VA. He first arrived in the Columbus area in 1948 and completed parachute training at Ft. Benning, GA. Since then he has become a hang-glider pilot and recently, a licensed private pilot. While a broker with Merrill Lynch, Herb's hobby turned into a career when he won an award from the Associated Press forBest Sports Photo in 1972. His love of the outdoors has led to many published works and commissions from wildlife organizations. 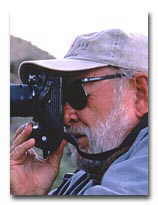 His pictures of wildlife have appeared in various outdoor and travel magazines such as Georgia Wildlife, Outdoor Life, Field & Stream, Quail Unlimited, Georgia Trend, Birders World and Brown's Guide to Georgia. Herb has traveled the world, from Alaska to Mt Everest to Uruguay and Zimbabwe. He has filmed wildlife and beautiful scenery and cultures from these exotic locales. When at home in Columbus, he and his wife, Truman, have hosted visiting international students at Ft. Benning, GA. for more than 25 years. Herb has continued to develop his art by taking every opportunity to learn and experience new technology. By digitally scanning images of wildlife and scenes from around the world, Herb has been able to create artistic images as Digital Watercolor Imagery. This procedure incorporates images drawn from over 50 years of his photography. Herb is a founding member of the Joseph House Gallery Cooperative in the Columbus, GA Historic District and his work is on display there. Herb has been the featured artist at Wildlife Exhibits in Lagrange, GA. and Callaway Gardens, GA. He was the first recipient of the LEONARD E. FOOTE Memorial Award for Excellence in Environmental Photography from Governor Zell Miller. Jim Cawthorne, CPP, is a Columbus native. He resides in Columbus with his wife Irene and daughter Erin. His photo training began in the darkroom with the help of his father Herb. This private darkroom business became part of Camera 1 upon it's opening in 1974. During high school he continued in the photo field being photo editor and photographer for his high school yearbook. Jim continued his studies of photography and is now a Certified Professional Photographer. He has taught a photo class for over 10 years for private and corporate lessons at Muscogee County School District, and Columbus College. Most recently Jim taught a camera club in Kiryu, Japan. Jim has published his photography in many places to include cover photos of State of Georgia Road Map, BellSouth phonebook, Guide to Georgia, City of Columbus Annual Report, Chamber of Commerce Directory, Quail Unlimited Magazine, International Softball Federation Magazine and other catalogs and magazines. His photos have been on the front page of the Ledger-Enquirer Newspaper, the Benning Leader, and used by Associated Press, United Press International, The Atlanta Journal, and various news agencies. Other publications and clients include the Olympics, General Motors, the Army Times, Columbus Museum, American Banker, AT&T, Mobile Oil, Blue Cross/Blue Shield, the National Infantry Museum, United Way, Arts and Entertainment TV, and the National Transportation Council in Washington, DC. Herb & Jim's work is not limited to the Georgia area. Their work takes this Father/Son team to all four corners of the globe. From Sri Lanka to Montana, Japan to Argentina, to Siberia, Scandinavia, and Botswana, the Cawthornes take every opportunity to capture our lives through their lenses! Copyright © Camera 1. All Rights Reserved.